Today marks the mid-point of Targa Tasmania, and three days of close competition is starting to take its toll on crews and their cars. But sticking to their own plan, Dean and Glenn have come through unscaved, and remain in 5th place overall. The #993 Subaru started the day well, quickly halving the lead of Jason White’s 4th-placed Lamborghini Gallardo. But as the top 4 pushed each other in the afternoon stages, that margin increased to 18 seconds by the end of the day. “We’re not too worried about the guys ahead of us. We lost a little bit to the Lambo’ today. But, realistically, if we can hold our place in the top 5, then we’re doing pretty well. There’s a few longer stages for the weekend, and things can change pretty quickly”. One of the main concerns for crews is tyre condition. A change of tyre incurs a two minute penalty, so managing tread ware over the five days of the event is vital. “Our tyres are in good condition, probably better than what we expected at this stage, and we’re not over-using the car. So that puts us in a good position for the next two days”. The crews leave Launceston tomorrow for the final time, heading first to Burnie on the north coast, then south-west to Strahan for Saturday night. For full results, check out www.targa.com.au. 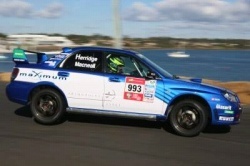 Images courtesy of www.targa.com.au. This entry was posted on Friday, April 18th, 2008 at 7:25 pm.